H O R R O R is definitely not a genre I read, but this novel for Middle Graders by Pam Smy definitely intrigued me when I saw it come into the library. Check out my thoughts below! Thornhill by Pam Smy was an unexpected read. I saw it come through at the library and it definitely intrigued me. I wasn’t aware that it was a Juvenile or Middle Grade book, but I’m actually quite glad that it was. The story follows the lives of two girls: one in photos and one through prose. Mary had lived during the 1980s and Ella, the girl in the illustrations, was living in 2016. I really enjoyed the juxtaposition of the two stories. Both girls were experiencing some of the same feelings of loneliness, but Mary’s story was a lot more gripping then Ella’s. Ella seemed to almost be discovering Mary’s story while Mary was living her story. I felt really bad for Mary and what she had to go through. It was sad to read about her life with the other girls at the orphanage. Mary had a lot to struggle through, but she also found joy in her creativity. It turned pretty dark at the end. With that said, I as a reader still wasn’t expecting the ending. I should have knowing that this was a darker story and slated as a horror novel, but still my brain is always trained to expected a happy ending of some kind or a hopeful ending. This story had neither. Overall, this novel really held my interested. I kept wanting to know what would happen by the end. Ella and Mary’s stories were both intriguing; although, Ella’s didn’t pick up until the end. While this novel was promoted as a horror, I didn’t find it as creepy as some others might have wanted it to be. I think overall it came across more of a psychological horror story then a scary or creepy one. I think that if you go into this novel with this in mind, it will be a good read for you. If you’re expecting to be scared or creeped out, I’d say that this isn’t going to deliver that for you. In the end, this was a quick entertaining read for me. It’s most likely not something I’ll reread, but I’ll definitely keep it in my arsenal for Reader’s Advisory questions I may get for horror books or even reluctant readers. 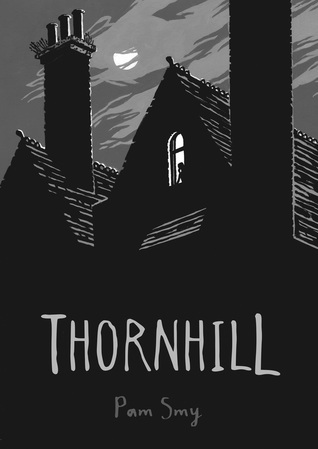 Have you read Thornhill? What are your thoughts about it’s take on horror? What about that ending? Have you read any other MG horror books? Let me know in the comments below! Prev post: Skin Deep by Kimberly Kincaid: A Book ReviewNext post: Everwylde by Donna Grant #BookRelease!